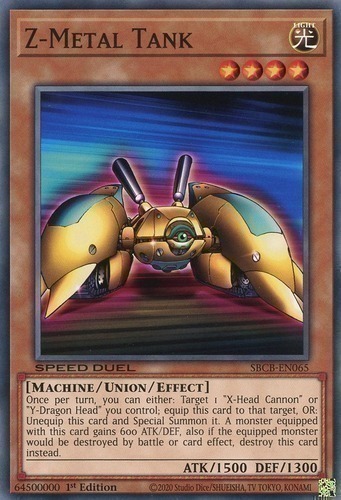 Once per turn, you can either: Target 1 "X-Head Cannon" or "Y-Dragon Head" you control; equip this card to that target, OR: Unequip this card and Special Summon it. 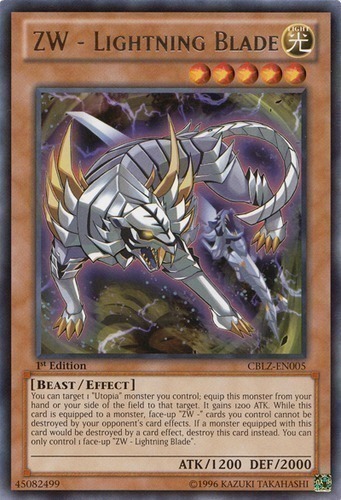 A monster equipped with this card gains 600 ATK/DEF, also if the equipped monster would be destroyed by battle or card effect, destroy this card instead. When this Set card is destroyed and sent to the Graveyard, select 1 Continuous Spell or Field Spell Card in your Graveyard, and add it to your hand. Activate only if you have no cards in your hand. 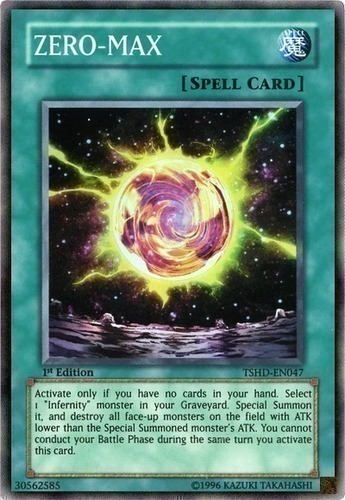 Select 1 "Infernity" monster in your Graveyard. 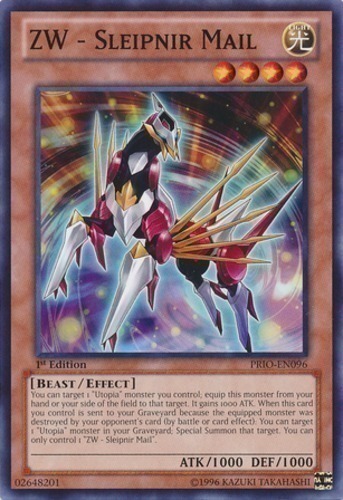 Special Summon it, and destroy all face-up monsters on the field with ATK lower than the Special Summoned monster's ATK. You cannot conduct your Battle Phase during the same turn you activate this card. If you control a "Utopia" monster: You can draw 1 card. 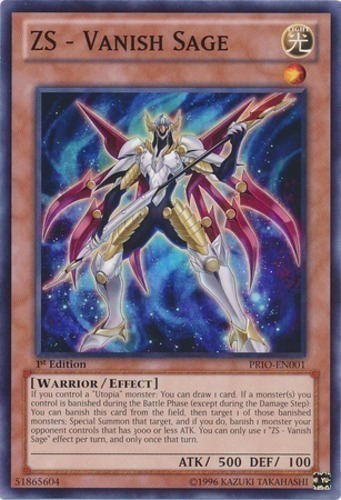 If a monster(s) you control is banished during the Battle Phase (except during the Damage Step): You can banish this card from the field, then target 1 of those banished monsters; Special Summon that target, and if you do, banish 1 monster your opponent controls that has 3000 or less ATK. You can only use 1 "ZS - Vanish Sage" effect per turn, and only once that turn. You can target 1 "Utopia" monster you control; equip this monster from your hand or your side of the field to that target. It gains 1000 ATK. 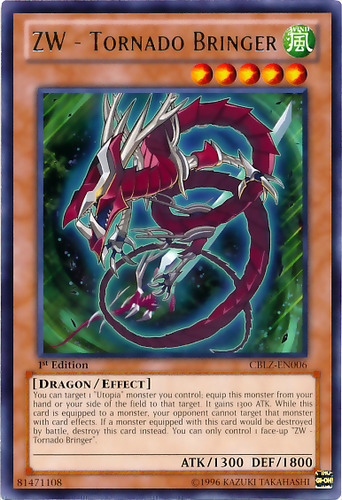 While this card is equipped to a monster, that monster can attack all monsters your opponent controls once each. You can only control 1 "ZW - Asura Strike". If your opponent's Life Points are at least 2000 higher than yours, you can Special Summon this card (from your hand). You can target 1 "Utopia" monster you control; equip this monster on the field to that target. It gains 2000 ATK. Once per turn, while this card is equipped to a monster, when a Trap Card or Trap effect that was activated on your opponent's side of the field resolves, negate the effects of that card. You can only control 1 "ZW - Eagle Claw". You can target 1 "Utopia" monster you control; equip this monster from your hand or your side of the field to that target. It gains 1200 ATK. While this card is equipped to a monster, face-up "ZW -" cards you control cannot be destroyed by your opponent's card effects. 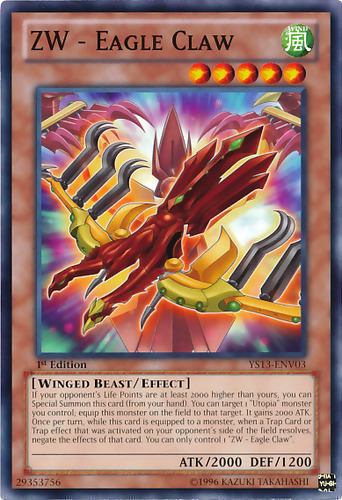 If a monster equipped with this card would be destroyed by a card effect, destroy this card instead. You can only control 1 face-up "ZW - Lightning Blade". You can target 1 face-up "Number C39: Utopia Ray" you control; equip this card from your hand to that target. It gains 1100 ATK. When the equipped monster destroys an opponent's monster by battle: Inflict 1000 damage to your opponent. You can only control 1 face-up "ZW - Phoenix Bow". You can target 1 "Utopia" monster you control; equip this monster from your hand or your side of the field to that target. It gains 1000 ATK. 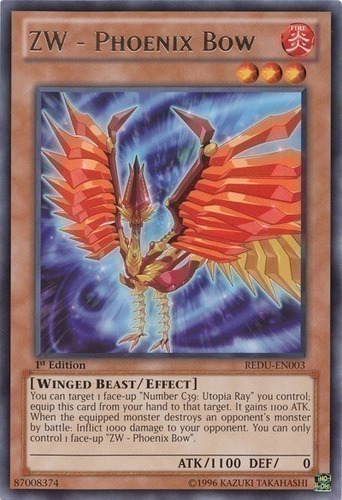 When this card you control is sent to your Graveyard because the equipped monster was destroyed by your opponent's card (either by battle or card effect): You can target 1 "Utopia" monster in your Graveyard; Special Summon that target. You can only control 1 "ZW - Sleipnir Mail". You can target 1 "Utopia" monster you control; equip this monster from your hand or your side of the field to that target. It gains 1300 ATK. While this card is equipped to a monster, your opponent cannot target that monster with card effects. 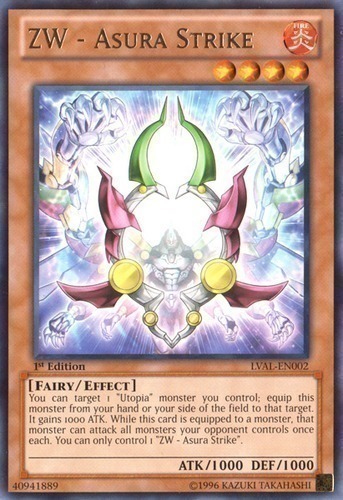 If a monster equipped with this card would be destroyed by battle, destroy this card instead. You can only control 1 face-up "ZW - Tornado Bringer". 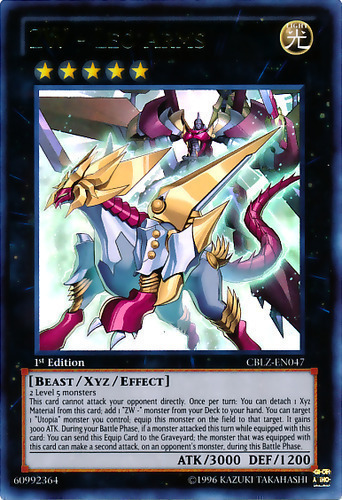 When this card is Normal or Special Summoned: You can target 1 of your banished Xyz Monsters; Special Summon that target in face-up Defense Position. You can target 1 "Utopia" monster you control; equip this monster on the field to that target. It gains 2000 DEF. You can only control 1 face-up "ZW - Ultimate Shield". 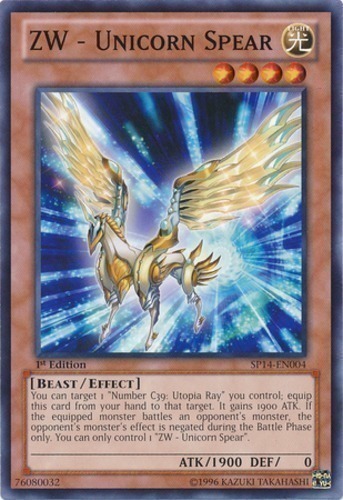 You can target 1 "Number C39: Utopia Ray" you control; equip this card from your hand to that target. It gains 1900 ATK. If the equipped monster battles an opponent's monster, the opponent's monster's effect is negated during the Battle Phase only. You can only control 1 "ZW - Unicorn Spear". 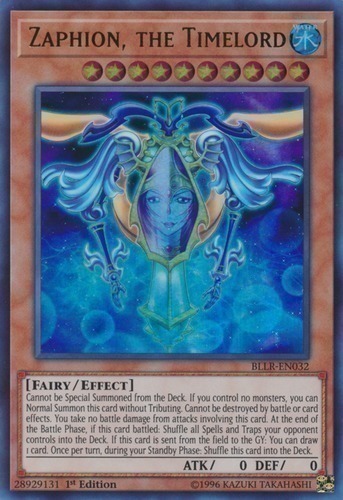 You can Tribute Summon this card by Tributing 1 Tribute Summoned monster. 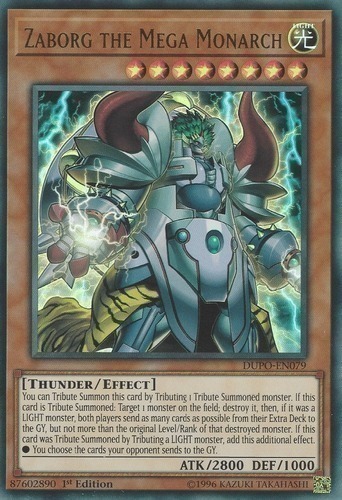 If this card is Tribute Summoned: Target 1 monster on the field; destroy it, then, if it was a LIGHT monster, both players send as many cards as possible from their Extra Deck to the GY, but not more than the original Level/Rank of that destroyed monster. 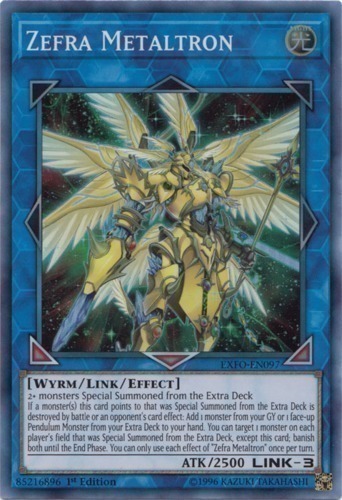 If this card was Tribute Summoned by Tributing a LIGHT monster, add this additional effect. ● You choose the cards your opponent sends to the GY. 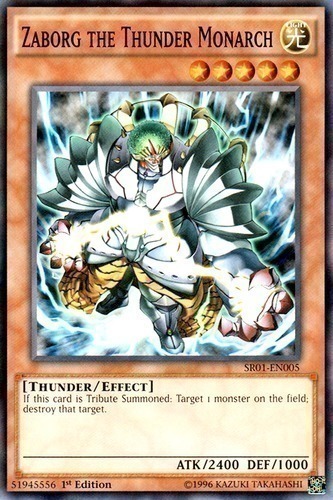 If this card is Tribute Summoned: Target 1 monster on the field; destroy that target. 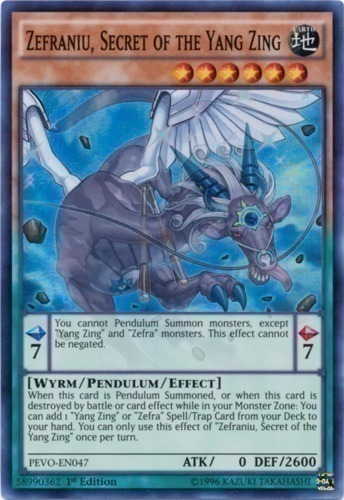 Pendulum Effect: Once per turn, during your Main Phase, if this card was activated this turn: You can choose 1 unused Main Monster Zone or Spell & Trap Zone; while this card is in the Pendulum Zone, that chosen Zone cannot be used. 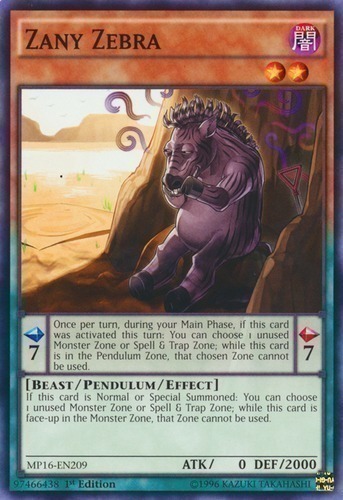 Monster Effect: If this card is Normal or Special Summoned: You can choose 1 unused Main Monster Zone or Spell & Trap Zone; while this card is face-up in the Monster Zone, that Zone cannot be used. Cannot be Normal Summoned/Set. 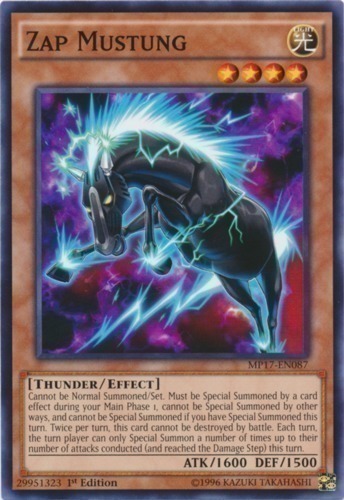 Must be Special Summoned by a card effect during your Main Phase 1, cannot be Special Summoned by other ways, and cannot be Special Summoned if you have Special Summoned this turn. Twice per turn, this card cannot be destroyed by battle. Each turn, the turn player can only Special Summon a number of times up to their number of attacks conducted (and reached the Damage Step) this turn. Cannot be Special Summoned from the Deck. If you control no monsters, you can Normal Summon this card without Tributing. Cannot be destroyed by battle or card effects. You take no battle damage from attacks involving this card. At the end of the Battle Phase, if this card battled: Shuffle all Spells and Traps your opponent controls into the Deck. If this card is sent from the field to the GY: You can draw 1 card. Once per turn, during your Standby Phase: Shuffle this card into the Deck. When a Spell/Trap Card, or monster effect, is activated: Banish 1 face-up "Zefra" monster in your Extra Deck; negate the activation, and if you do, destroy it. 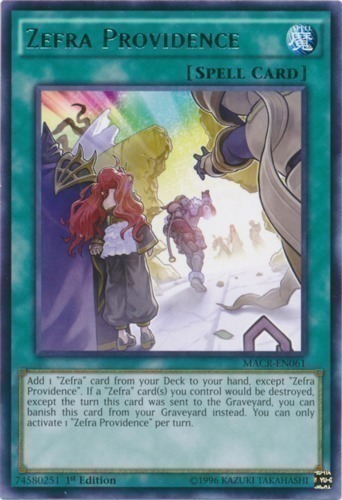 Add 1 "Zefra" card from your Deck to your hand, except "Zefra Providence". 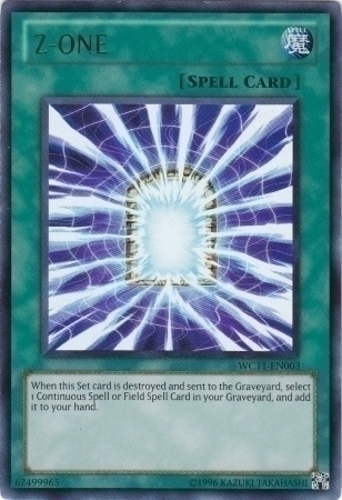 If a "Zefra" card(s) you control would be destroyed, except the turn this card was sent to the Graveyard, you can banish this card from your Graveyard instead. You can only activate 1 "Zefra Providence" per turn. Target 1 other "Zefra" card you control and 1 card your opponent controls; destroy them. 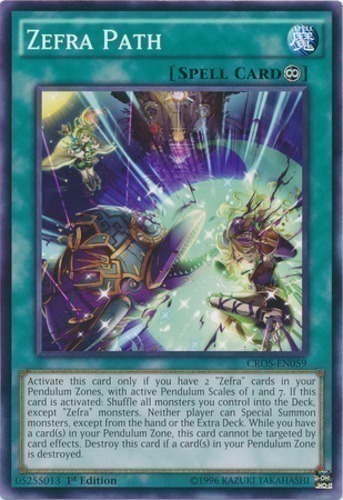 If you have 2 "Zefra" cards in your Pendulum Zones, you can activate this card from your hand. 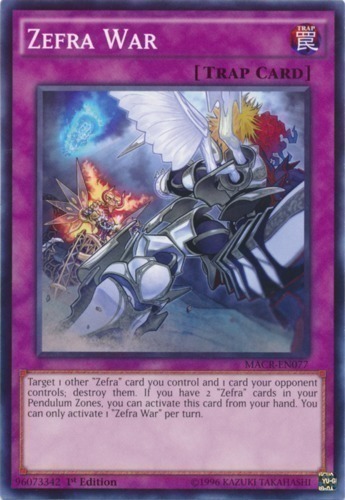 You can only activate 1 "Zefra War" per turn. Monster Effect: Cannot be Normal Summoned/Set. 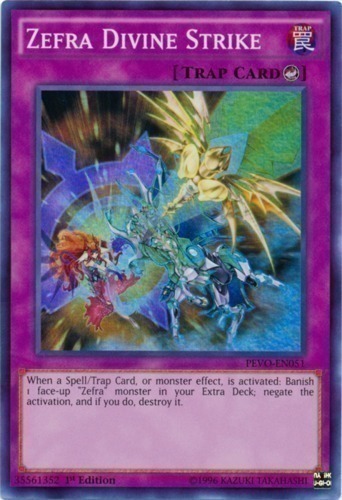 Must be Special Summoned (from your face-up Extra Deck) by Tributing all monsters you control, including at least 3 "Zefra" monsters, and cannot be Special Summoned by other ways. 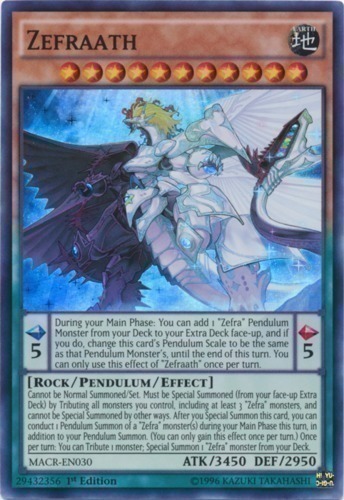 After you Special Summon this card, you can conduct 1 Pendulum Summon of a "Zefra" monster(s) during your Main Phase this turn, in addition to your Pendulum Summon. (You can only gain this effect once per turn.) Once per turn: You can Tribute 1 monster; Special Summon 1 "Zefra" monster from your Deck.